Three of Medway & Maidstone AC athletes represented Kent Schools at the English Schools Cross Country Championships on Saturday. The event took place at Temple Newsam Park, Leeds (Yorkshire). This event is considered to be the pinnacle of a young athletes race calendar, and many of the top elite athletes cite this as a stepping stone to their future success. The course was a challenging hilly, technical course, made even more difficult due to the weather conditions on the day – 40mph winds and rain all day! It was certainly a muddy affair and more so as the races progressed throughout the afternoon. Hamish Reilly competing in the Inter Boys’ age group set off over the 5km course without any expectations or pressure as he hadn’t long returned from an injury. Starting 4th in the pen he knew a good start would be crucial to staying out of trouble and getting near to those starting from the front. Throughout the race Hamish moved his way through the field of over 300 runners, picking his attacking moments carefully to find himself in a bunch of runners closer to the front, and realising he was in with a chance of finishing in the top ten. From here he pushed on hard up the final hill to split the group up, and ensured he had enough left to run home in 7th place overall. He was rewarded with his England schools’ vest and an invite to compete in the Home Nations’ International in Dublin this coming weekend. The Kent U17 Boys’ team were also victorious (6 runners counting to the overall team position), and Kent Boys won the overall aggregate team trophy across the three age groups. In the Junior Girls’ Race Anna Palmer was rewarded for her great season and capped it off with 78th position from a finishing field of 353 runners over the 3km. She also helped the girls team to an excellent 3rd position. 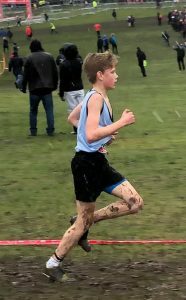 In the Junior Boys event run over 4.1km, the rapidly improving Hayden Gear fought his way through the crowds, having started at the back of the Kent team pen, to finish a credible 132nd and contribute to his team’s 6th position. A BIG well done to all athletes and also to their coach, Steve Fury. All the best to Hamish this weekend.